Driving this growth is the increasing importance placed upon environmental regulation and enforcement across the GCC, said Alexander Hardie, senior business development manager for the UK-based company. The company provides a broad range of services covering environmental protection and monitoring. These include sampling and analysis of groundwater, soils, wastewater, seawater and marine sediments for a large variety of organic and inorganic pollutants. It also performs ambient air quality monitoring using a range of techniques from simple diffusion tube monitoring to the deployment of fully compliant US EPA ambient air quality monitoring stations. Additionally, it performs stack emissions testing and microbiological services. “Our monitoring services are frequently required as part of an environmental impact assessment (EIA) for major construction and infrastructure projects. This sets the baseline conditions prior to commencement of works, continually monitors environmental performance during construction and ensures the project delivers minimal environmental impact during the operational phase,” explained Hardie. “Other services such as stack emissions testing and ambient air quality ensure major process operators like refineries are working within their regulatory permits and to the highest local and international standards. Our ongoing monitoring programmes also ensure a rapid response to any pollution incident thereby reducing any impact on the environment,” he added. 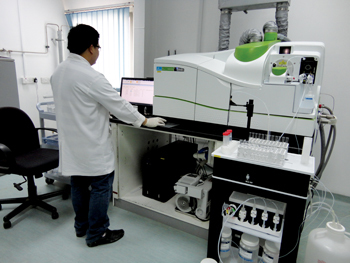 Exova currently has five major environmental laboratories across the Middle East (Dubai, Abu Dhabi, Oman, Qatar and Saudi Arabia) and over 40 site labs across the Middle East. “Our strategy contains a number of elements which include leveraging of our existing clients who have additional offices in new territories; opening dialogue with local regulators and authorities who are responsible for environmental regulation and enforcement; identifying local competent and credible partners and targeting strategic acquisitions,” remarked Hardie. Besides ongoing contracts, the group won several high profile and lucrative contracts in the Middle East region for environmental testing in 2015. The company won a three-year contract for soil and environmental chemical analysis and compliance from the Doha Metro. It was also awarded a five-year contract by a major power and water company in Abu Dhabi for onsite and offsite water testing support and advisory services. Other major projects include the provision, installation and commissioning of two mobile ambient air quality monitoring stations for a major petrochemical company in Oman and a similar project at 12 mineral mines and process plants across Saudi Arabia. When asked about future prospects, Hardie remarked that “Exova is in a strong position to continue growing throughout 2016 in spite of market pressures related to the drop in oil price.” He added, “the company continues to invest significantly in the latest technologies to further improve detection limits and accuracy in laboratory testing. Additional environmental services planned include Fugitive Emissions Testing, expansion of current ambient air quality capabilities and asbestos monitoring and analysis services. “Going forward, the company is reviewing options to invest in new territories such as Egypt and Iran, as a result of the ever changing socio-economic factors in these countries”. Besides environmental testing, Exova is involved in the testing of materials, civils, metallurgy products and food and is also engaged in fire consultancy.